This was a time before television and the local dances were a major form of entertainment. Local musicians played and at a very young age I would sneak out of the house in order to go to the dances to learn the music. I would wait until I thought my mother was asleep, and for added protection I turned my jacket inside out as a disguise. Then I would creep out the window and run to the dance. My reason was to learn the music of my people. I would stand in front of the musicians with a little pad of paper and a pencil and draw the frets of a guitar and takes notes where the musicians placed their fingers. I watched how they strummed. I observed, I took notes, and I learned. Then…………. I would make my way home through the dark night, climb quietly back in through the window and find…………. My mother waiting for me with a belt! How do mothers know everything? Still, as she fell back to sleep, I would remain awake and as quietly as I could I would practice what I had seen, and in this manner I taught myself how to play. Music was simply a part of my culture and many of the boys could play instruments. The balmy summer nights were perfect for adventure, music, and fun! We’d plan where to meet, and then, again with mothers asleep, we’d rendezvous at the appointed time, steal a neighbor’s chicken, take off up into the mountains, and there, under the pine trees, we’d roast the chicken over an open campfire and play music and sing until dawn. Each of us shared with the others what we had learned and we built a repertoire. There was a local man who was very knowledgeable, knowing the old songs from days past. I so wanted to learn these and found a way to get him to teach me. It so happened that in addition to his love of music, he also had a love of wine. And so trades were made! I supplied the wine, and he sang the songs for me. I collected, in my head. I did not yet know how to either read or write music, so I memorized. I memorized a lot of songs. Sometimes I would try in vane to get the older boys to teach me. “No,” they would yell, “go away. You are too little.” But I wasn’t and it made me angry and I yelled back, “Someday I will be better than all of you,” and for emphasis I went after them with my slingshot. A turning point came when I got older and was playing professionally without any formal training. I was completely self taught. A lady approached me at a break between sets and asked if I would play a song for her. “Sure,” I said. She handed me some sheet music. I looked at it in complete confusion. What side was up? Which down? What were these symbols? I realized I had a weakness. A bachelor’s degree, two master’s degrees and a PhD followed. I received my baccalaureate degree in Music Education from Highlands University. Upon completion of my undergraduate work I received a scholarship to pursue a master’s degree in Bilingual Education, again from HIghlands University. Another scholarship followed. This time from the Mexican government. In Mexico I studied at the National Institute of Fine Arts where I obtained a second master’s degree, this one on Ethnomusicology. While studying in Mexico I would go to every and any place where music was played, including dance halls and bars. From these excursions I absorbed the knowledge of so many different styles of music. I began my career as a professor at Northern New Mexico College in 1980, and retired from that institution in 2004. It was during this time that I also completed my doctorate in Ethnomusicology, which I received in 1988. This same year I became the Chairperson of the Fine Arts Department, a position I held for ten years. Because of my love of music and teaching I have continued to work at NNMC as a part time instructor in folk music. My early background and training in music has instilled in me a passion for preserving and disseminating the folk music of northern New Mexico. From my several presentations at the Smithsonian Institute in Washington, D. C., to the elementary school classrooms of New Mexico, and cowboy poetry gatherings in Elko, Nevada , I have done thousands of performances and presentations. I have brought this music to various regions throughout the U.S. and have performed in several states in the country of Mexico. 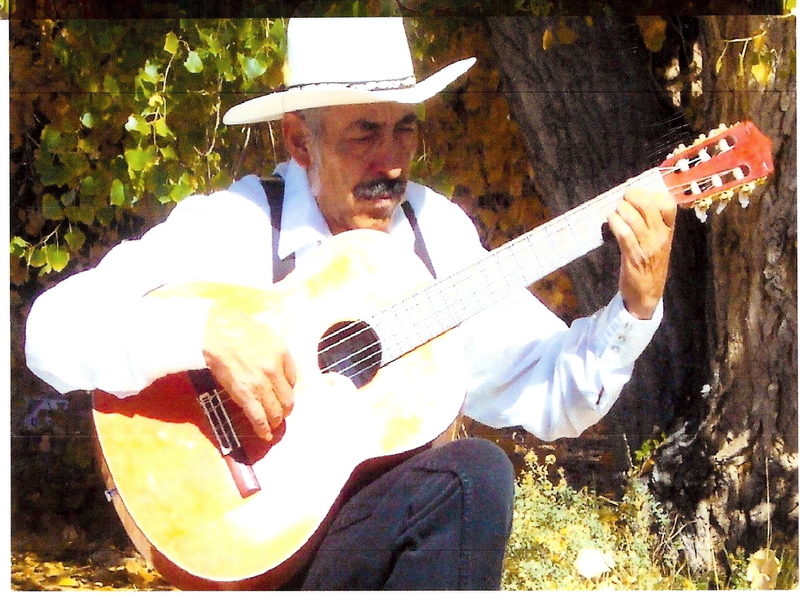 These presentations consist not only of traditional New Mexican folk music but also La Nueva Canción (the new songs), a style that originated in South America. I have also preserved this music on recorded CDs. I have self published a four volume set of traditional New Mexican folk music, with accompanying CDs that I use with my students at NNMC. Another self published work is a collection of my own compositions written in this traditional style as well as the style of La Nueva Canción. I also self published a manuscript of sixty-seven of my compositions for violin and guitar, which I use with my folk ensemble class. I have written several compositions for theatrical performances and for films. Recently I have composed and recorded several one movement symphonic works named Poemas Musicales (musical poems). UNM Press is currently publishing a book I wrote of the folklore of New Mexico which will be accompanied by twenty-one long playing CDs. In my many presentations at the local schools I bring part of my collection of over three hundred musical instruments from around the world. I play them and give the students a little history of the instrument. It is a joy to me to see their expressions as they become excited about music, their culture, and the culture from which the various instruments have evolved. My presentations and performances have won me several prestigious awards. These include being honored as a Living Treasure, the Governor’s Award, the New Mexico Endowment for the Humanities Award. I have been nominated three times for the National Heritage Award for outstanding work in maintaining and preserving traditional folk music. My son, Cipriano Pablo Vigil, and my daughter, Felicita Vigil Piñón, also perform with me in concerts. They learned and have been practicing these same traditions and music since a very young age. My son and daughter have been performing with me for about 25 years. Recently, my granddaughter Marisol Vigil (14 years old), my grandson Mitzael Piñón (8 years old), and my youngest grandson Alonzo Vigil (3 years old) have been performing with us on stage.